Some flat roofs have pebbles instead of gravel, depending on the preference of the business owner. However, the purpose remains the same—to protect the underlying layers of the roofing membrane against the harmful effects of prolonged sun exposure. The small rocks spread several inches thick over the roof can help prevent cracking and peeling due to the sun’s heat. In addition to protecting the roofing membrane, the gravel also weighs the roof down and effectively provides added security, especially for single-ply flat roofs. In short, these layers of gravel can substantially extend the service life of a commercial flat roof by several years, as well as help cut back on roof repair costs. 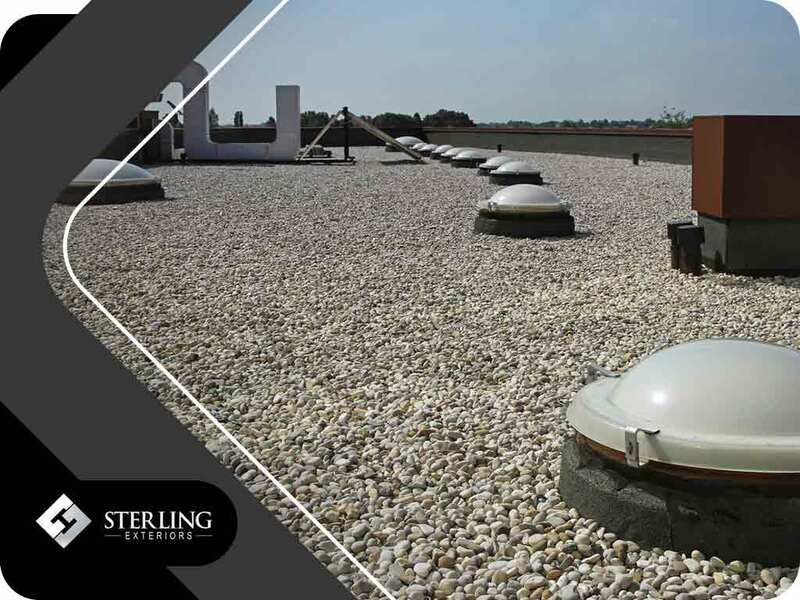 Gravel on top of a commercial flat roof also acts as a filtering system for the roof drain. Accumulated junk and debris can clog the drain pipes and cause substantial water damage. The pebbles block leaves, twigs and other debris from reaching the drains. Gravel also absorbs heat and protects the roofing membrane from hail. On top of that, the small rocks provide better grip and even weight distribution for foot traffic during inspections, repairs and maintenance checks. If you’re looking for excellent workmanship and top-notch products, look no further than Sterling Exteriors. We specialize in home improvement services, from roof repair to siding installation. We can also design and construct the outdoor living space of your dreams. Call us today at (513) 322-4777 to get a free quote. We work with commercial and residential properties in Anderson Township, Milford, and Newtown, OH.